2006 saw me switching onto the so called 'solid', 'no plastic' bike- 'Bullet'.I can without any biases credit my RE which I called 'Black Cat' for getting me into touring and adventure riding. 60 KPH as a motorcycle travel club was instrumental in organizing annual rides which saw me doing Ladakh (every riders dream destination), Rann of Kutchh, Chakrata, Chambal, Himachal Pradesh and more. I traversed across the length & breadth of the country on my 'Black Cat' , though she never failed to pose problems after problem during each ride but I still cajoled and caressed it and voila, that would see her do well till the next trip. This was the period where I tried and tested various improvement on the machine to enable riding comfort and performance enhancement (albeit that was a dream far fetched). Black Cat must have had more than 4-5 handle bar changes - cruising , chopper style , just freaky , supported etc. , more than 3-4 seats modifications like buckets , one piece cruising, back supported and ofcourse varied patterns & colors to keep adding life to my machine. I used this machine not only on road but very consistently offroad too zipping some of the toughest trails in Ladakh, Chambal, Uttrakhand , Rajasthan & HP. The launch of RE Himlayan in 2016 unfurled another segment of riding called 'Adventure Offroad Riding' & a RE loyalist like me was overwhelmed at the idea if this under 2 lacs bike. I was one of the earliest owners of REH which i named ' Stealth'. The offroad capabilities of the motorcycle were impressive and I was mighty gaga with the type of things I could do now with the bike, like - drifting, wheelie, bunny hops and ride ruthlessly over undulating terrain. The feel of the bike was a bliss when compared to my old friend ' Black Cat' both on and offroad. The riding comfort was immense that I without a thought decided to ride to 'The Riders Mania' in Goa. And so began the Gurgaon - Goa - Gurgaon solo ride. 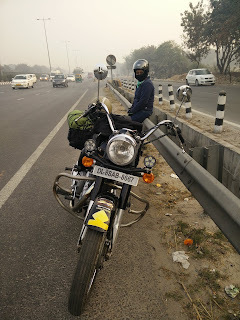 The entire trip was mesmerizing with me clocking more than 700 kms without a sweat. 'Stealth' reposed my trust in her by not letting me down even with a flat - its performance was par excellence. The bike could zip upto 130 kms with no vibration & total control- I was loving this new found love of trail on and off. Goa sojourn instilled my confidence in the machine & and its performance over trails and my improved riding skills bounced an idea off me to try myself out in 'Raid De Himalaya' - The 19th edition in 2017. Well Raid De Himalaya is considered as the 'India's toughest rally' at insane altitudes of 11000 and above. The tag line says - ' Making grown men cry since 1999 and I think this is what challenged the 'fauji' inside me and the thought ,' Difficult is routine, impossible may take some time', froze the thought for execution. I knocked off a lot of unwanted weight off my bike in which I removed the front panniers, headlight assembly, centre stand, rear cowl and more. I also picked up knobby tires for better control on offroad. My regular trails and riding continued with an intent to improve my skills as I was upto something very very tough and that too for the 1st time. Finally the race day came rather quickly and I was knee deep into it trying to put in my best in each stage and leg . Till day 3 I continued to stay in the race albeit 3-4 falls on black ice on the infamous and grueling Losar Gramphoo stage. Since the bike is heavy , I could feel losing speed on downhill as braking a big bike is not at all easy and brakes would go free .Heavy steering also takes a toll on your shoulder and back which get pumped up very fast causing constant fatigue. Long turning radius and heavy handling takes a toll on the nimbleness & handling . 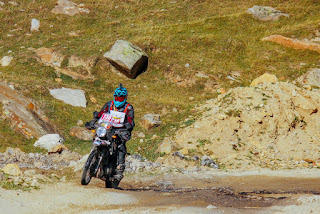 But if all this was not enough then the night came in as a shocker as there was a change in plan (very akin to the organizers of Raid) who announced that we needed to ride down from Leh to Kargil in the night itself and line up for the Stage 4 early next morning. This thought shook me hard as my bike was not night ride ready nor was me - I did not have a beam headlight nor was I carrying any thick riding jacket to beat the chill as it was freezing cold there. I finally decided against moving on and pulled out of the race, Though had I had continued I would have surely been on the podium as there were only 2 more competitors in the Group D - RE Stock category.But the dream of wielding a shield had already been washed out! Next onn the bucket list was Sjoba. My past experience of rally riding helped me prepare for this rally which is a shorter format and happens in the backyard of the Simla hills . The stages are shorter but very fast hence the idea of riding a 180 kilo bike was a courage dampner. I spent some time further trying to lighten my bike in whichever was I could and tried losing a couple of kilos so that both could work in tandem. Sjoba was another well organised and crispy rally which I enjoyed to the hilt this time finishing on the podium winning 2nd prize in the stock category. By now I had gained some rally experience and knowledge interacting and learning from some seasoned and established riders like Gurjinder Malwa aka Paaji, Amardev Singh , Irfan Alam , Nitinjeet Bawa &many more. I had picked up a Honda Impulse which I worked on and modified to the best of little knowledge I had. I strongly believe that its 80% rider and 20% machine which make for a perfect ride hence I continued to practice regularly - alone most of the time without any apprehension of company. Rain, heat, dust and grime became my best friends and I continued to sharpen my skills on the trails which were right in my backyard. This year Raid was to commence not from Shimla or Manali or even Leh , but Kargil. I worked towards panning each ride day and conceptualizing my strategy for each stage considering the altitude , sub zero temperature, wind chills, depleted oxygen levels and ofcourse the limitations of my machine at 150 cc stock engine. I was pretty impressed with my performance as I left no stone un-turned in putting in my best step forward. I finished overall 10th on Day 1, Day 2 saw me lose my position by a slot as I had to ride on a flat during Kargil - Drass stage for over 25 kms but it was a great learning and I still could finish without getting a DNF (Did Not Finish). Day 3 saw me clocking an excellent time from Panikher to Rangdum which was a flat out stage with loads of undulations which i flew and jumped over. Finally Day 4 which saw me struggle against all odds like a -17 deg cel temp, a height of 17600 feet in the form of Tanglang La to be conquered and 150 cc engine. I again introspected and planned my strategy - I decided 'No Braking' as this would lead to time and power loss on uphill. 5 , 4, 3, 2 , 1 'Go' and I let go all my horses till I crossed the finish line at Debring with another great timing.